Cross the road to view the Town House exterior. New buildings are usually controversial, and Irvine Town House was no exception. In 1860 the Provost, Thomas Campbell, was so against this large Italian style edifice that he boycotted the ceremony for laying the foundation stone. For a cost of £4,000, the Town House provided the Royal Burgh with a new council chamber and court house. No prison cells for local miscreants were required – not because Irvine didn’t need any, but because the new Police Station contained some. Above the Town House is a handsome clock and belfry, terminating in an octagonal steeple. So, what did Provost Campbell unsuccessfully propose? He wanted the old Tolbooth to be renovated. The old Tolbooth stood in the middle of this wide High Street, with its council chamber, court room, prison cells, and ground floor space for three shops and the town fire engine Although historic, it had become seriously dilapidated. Originally constructed in 1386, it had become a fine two-storey building with a steeple, and had received major renovation in 1672 and 1745. The options were to renovate or replace. 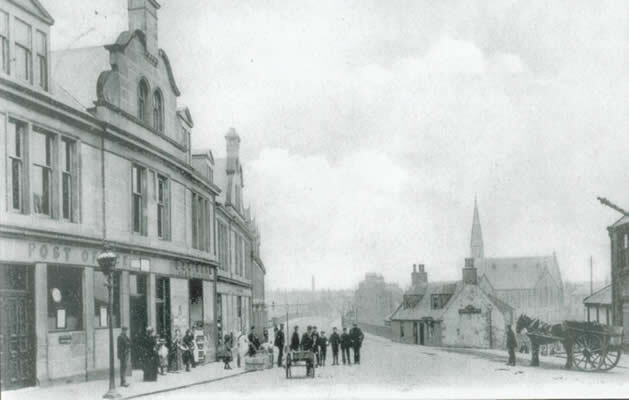 Provost Campbell lost the argument, and Irvine lost its old Tolbooth – but gained a grand Town House, opened in 1862. One item from the old Tolbooth was brought over to the new building – look to the top of the steeple and you will see the weathervane in the shape of a sloop, recalling Irvine’s past glory as a major port in the days before the dredging of the River Clyde. In the roadway, you will see a circle marking where the market cross once stood. A market cross, as local historian McJannet remarked, was “the focus of the burgh, the meeting place of the burgesses, the spot at which proclamations were made, and the scene of public rejoicings of all kinds”. The cross no longer exists, but the War Memorial to the right suggests what it may have looked like. That War Memorial, placed in front of the Town House after the First World War, was hit by a runaway truck in c.1951 and re-erected in its current position. The above is a draft podcast text. Here we can add that the anti-militaristic feeling of the 1920s/1930s occasioned the removal, in 1929, of two old cannon from their place in front of the Town House (as well as the removal, from the parish churchyard, of two captured German guns). Walking route: Going left (north) and crossing to the other side of the High St., pass The Carrick hostelry (formerly the Eglinton Arms, dating back to 1719) and look out for the first of the signs about historic closes. The pavement artwork, lifted during paving reinstatement in 2013, will be relocated in due course (description below). One of the many narrow closes situated between the overcrowded tenements, it led past the old bowling green to East Road. This is the Close where Purdom, the Master Baker, carried out his business. This is the Close where the blacksmiths made horseshoes and fitted them onto the horses. This is the Close where the tradesmen Coopers made wooden barrels to store beers and spirits. Another old close, named after Provost Pawkie, the main character in John Galt's novel "The Provost" (1822), based on Bailie Fullarton (a councillor for 42 years, 1790-1832). John Galt lived across the street from here. Walking route: At this point, cross the street at the Bank of Scotland before returning to the right hand side. A plaque to the right of the door of the Bank of Scotland commemorates that the birthplace of John Galt, novelist, stood here. John Galt was one of the first two Honorary Members of Irvine Burns Club, in 1828, as described elsewhere on this site. The plaque was created by Ayrshire artist, Robert Bryden, R.A.; it reads: “John Galt – born here 1779 – died at Greenock 1859” and is signed “R Bryden fecit 1903”. Walking route: Continue on the right, past the Library, until you reach a fine Edwardian red sandstone building with Provost's lamps outside it (at a bus stop!). Also manuscripts, honorary members' letters, stained glass window, sculpture, and much more. Walking route: Cross the road at the Burns Museum. Though there are no visible traces, here once stood one of the town ports, or gateways, the West Port, long ago demolished to widen the road. Universty of Glasgow classes once met here in Eglinton Street. In 1626, Irvine Burgh Council had given £100 towards the redevelopment of Glasgow University. In the same year, a native of Irvine became its Principal, and the ministers of Irvine and Kilwinning were, in 1642, appointed professors of divinity. No wonder, then, that when smallpox struck Glasgow in 1645-47, the university was evacuated to Irvine (and to Pasley). Where exactly classes were taught and staff were accommodated is not clear. The evidence (quoted by Coutts, 1909) is that bursars were boarded from the start, and the principal and professors soon afterwards, and that maltman John Graham was paid for "furnisching of the house". The site was later occupied by the Elephant Inn, of some notoriety, which, in its turn, after years of dereliction, was replaced by two council houses after WWII. While McJannet's 1938 History of Irvine states that "tradition records that many of the students resided in the Elephant Inn", and castigates its impending destruction as an act of 'ignorance', Strawhorn's 1985 History of Irvine records that classes were conducted in a malt barn. The building referred to in the University records, whatever it was, was not an inn - the Inn will date to after the University use of the premises. The Bachelors' Walk was the name given to this part of the street many years ago. The name arose from its popularity with young men strolling to impress. Walking route: Now continue, facing the town centre, for a short distance. When you meet Seagate, turn right down the cobbled street. The street leading to the seaport when Irvine was first established. It was refurbished by Irvine Development Corporation in 1994. There was a castle in Irvine in 1184, in the form of a wooden tower on a 'motte', the location of which is not known. The first stone Seagate Castle probably dates to the 1360s, constructed by Sir Hew of Eglinton. The greater part of the third and still surviving castle, incorporating the 14th century square stone tower, was built by Hugh, 3rd Earl of Eglinton (1564-85), possibly in 1565, after his marriage to Margaret Drummond. What follows is a draft podcast text. Firstly, let us explain the name Seagate. It is not a gate. The old town gateways were called ‘ports’ from the Latin word ‘porta’, so if you buy a refreshment in Irvine’s Porthead Tavern, you are on the site of one of Irvine’s old gateways. The word ‘gate’ is not a gateway, but a street because you go along it, so Sea-gate means the street leading to the sea. The sea was once much nearer to the town than it is today. The first stone Seagate castle probably dated to the 1360s, constructed by Sir Hew of Eglinton, the local laird. Part of its 14th century stone tower still remains in the north-west corner of the present – third – castle, constructed in the Scottish Renaissance style, possibly in 1565, by Hugh, the 3rd Earl of Eglinton, after his marriage to Margaret Drummond. On two bosses in the vaulting of the entrance passageway are the initials of the married couple – HM and MD - and the coast of arms of the Montgomerie and Drummond families. Its ground floor contains kitchen and guard chamber, with two vaults and small windows. The first floor contains two large apartments and a great hall, with large windows. Another floor, now gone, had other chambers. There is fierce controversy over whether Mary Queen of Scots, that feisty young monarch, stayed the night here in 1563. Some say she did, but the records state explicitly that she stayed at Eglinton on 1st August. Perhaps she paid a fleeting visit to a castle under reconstruction at the time. Seagate Castle is Irvine’s oldest building, but looking at it today, it is difficult to believe that it was once referred to as a ‘Palace’. It had ceased to be occupied by the 1700s. The 10th Earl removed the roof to provide timbers for a church in Ardrossan. It was ruinous by 1760. It became a haunt for smugglers and a quarry for building stone. Debris was removed in 1883. It is unfortunate that safety concerns now forbid public access. Walking route: At the end of the road, turn left to face the river. David Boyle, born at the Parterre House in Irvine in 1772, became an advocate in 1793, then Solicitor General and MP for Ayrshire 1807-11, was Lord Justice Clerk 1811-41 and Lord Justice General and President of the Court of Session 1841-52; he died in 1853. The statue, sculpted by Sir John Steele, was erected in 1867 outside his birthplace (the Parterre) opposite the Town House, and was moved to its present location at Seagatefoot in 1929. Walking route: Follow the road round to the left, and at the first opportunity, join the path through what is named the Low Green. Face the shopping centre and make for the Trades memorial in the middle of the grassed area. This eight-sided pillar was erected in 1996 on the 350th anniversary of the granting of a common seal to the seven trade guilds of medieval Irvine in 1646. The Hammermen - first recorded meeting 1646, annually thereafter without a break - included smiths, pewterers, coppersmiths, goldsmiths, armourers, lorimers, cutlers, gunsmiths and (strangely) saddlers. The Weavers - who worked in wool, linen, cotton (from 1780) and muslin -their minutes go back to the 1700s. The Tailors - their minutes going back only to 1889, as earlier records were lost or destroyed. The Cordiners - "shoemakers and other wortkers in leather"
The Wrights and Squaremen - the only craft which still requires applicants to make an "assay piece" to gain entry. The Skinners - those who prepared raw skins into hides which could then be used by cordiners and others - after the demise of such workers, and their craft guild, it was reconstituted in 1920. The Coopers - makers of barrels - for ales, for salted beef, for fresh water on voyages, for gunpowder, for anything. Looking across the river from the Trades Pillar, you see the Council headquarters block ('Cunninghame House') It is on the site of a religious house, founded in the mid 14th century, when one of the Fullarton family gave land to the Carmelite Friars (the White Friars). Their priory was one of ten Carmelite houses in Scotland. The church properties were feued by the last prior in 1558, and demolition of the buildings must have soon followed, as nothing remained by 1600. It had been in existence for about 200 years. (above you to left) the Mure Church, built in 1849 as the Irvine Free Church - in 1900 it became the Mure United Free Church). Trinity Church, opened in 1863 (more below). Fullarton Free Church, built in 1844, under the seceding minister Rev. Wilson). Fullarton Parish Church, opened in 1838 as the first parish church for the Fullarton part of Irvine, which at that time was part of the Parish of Dundonald. Also while standing by the Trades Pillar, you can recall the road bridge demolished in the 1970s. Though Ayr had a bridge from 1236, Irvine seems not to have, and historian John Strawhorn ('The History of Irvine', John Donald Publishers Ltd, 1985) suggests the first timber structure may have been built in the 14th century, especially as the burgesses could build a tolbooth at that time (1386). The first stone bridge may have been about 1500 (the first mention of Bridgegate is in 1506), and certainly before 1533. In 1578, the whole of Ayrshire was required to contribute to its repair. In 1589 and afterwards the burgh levied tolls on those crossing it, for repairing the 'decayit brig'. A few years later, Timothy Pont mentioned Irvine's 'fair stone bridge'. Transporting coal across the bridge was prohibited in 1695, after which carts had to use a nearby ford. Increasing trade led to a new bridge being built in 1748-53 (though only 11 feet wide, as wheeled vehicles were still uncommon), with four semi-circular arches each of forty feet span, at a cost of £350. The council obtained parliamentary consent for widening the bridge in 1826, and this was done, to a width of 25 feet; the pontage tolls had paid for the improvement, and were removed by 1850. It was provided with iron latticework sides in 1887, widening it to 38 ft. The bridge was closed on 10 June 1973, and demolished to make way for a £5million shopping centre. Many residents of Irvine believe that the shopping centre could, under less brutalist planners, have easily incorporated the old bridge as an attractive and functional centre-piece. Walking route: Return to the road, keep to the right, and take the concrete steps upwards to get to the refurbished plaza. In the pavement (refurbished Nov/Dec 2013) you can follow a trail of important dates in the story of Irvine <details to be added>. Here also you can look up at Trinity Church. The Burgher Church was a Secession congregation meeting originally (from about 1809) in Cotton Row (now Ballot Road). Their first minister (Rev Alexander Campbell) presented Irvine Burns Club with the six original manuscripts which his wife had inherited from a previous husband. In 1847, the Burgher Church became, like the Relief Church, a United Presbyterian Church. Under their second minister, the widely-known and widely-respected Rev William Bruce Robertson, the church moved into Trinity Church in 1863. The site had been gifted by a member of the established church. There was a procession of magistrates and councillors for the laying of the foundation stone. Designed by T F Pilkington, it is cruciform in pattern, in Venetian Gothic style, with variegated clour in the stone, and ornate throughout. Its 170-foot spire was completed in 1869 and shortened in 1870 when found to be too heavy. In 1900, it became one of the four United Free churches in the town. It ended its days as a church in 1966. 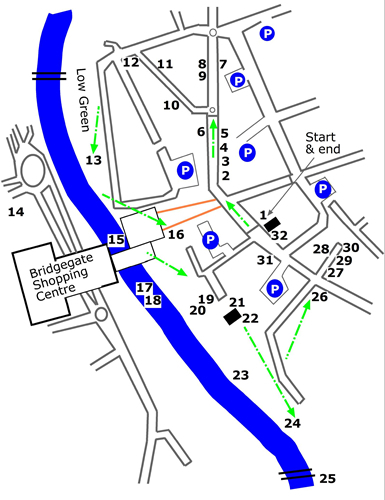 Walking route: Go into the shopping mall, keep round to the left inside, and exit by the door onto the riverside path. Stop and look at the river. According to tradition, the ford at this site prior to the building of a bridge, the Puddleford, was the site of a skirmish between Wallace and the English - there is no evidence that Wallace was present, but the tradition gained credibility when repeated as fact in the 1920s. An interesting possible origin of the name is as 'holy steps' ('pas de Dieu'), the stepping stones by which the monks from the Carmelite Priory made their way to Church. Some of the stepping stones may have come from the stones later removed, of which the Granny Stane (see next item) is the last survivor. Use of the Puddleford by horses was prohibited in 1836 to safeguard access to the Puddly Well, one of the public wells all of which were repaired at about that time. Described as "one of Irvine's prehistoric puzzles", this boulder may be one left behind from the Ice Age or the last remaining stone of a stone circle - other stones were removed, by blasting, after the weir was constructed in 1895, but popular protests saved this remaining stone. Pleasure boats and bathing were introduced. The Grannie Stane is visible when the water is low. It is unlikely to have gained its name from various similar sounding Roman and Celtic deities. Walking route: Now take the gentle slope upwards to the left (the block paved path) to reach the Kirkgate (the square in front of the church). On your left is The Old Manse, but it was a manse for the minister of another church, not the incumbent at the Old Parish. Walk towards the church, along the right of the street, stopping at the last building before the churchyard. The Old Manse belonged, in 1819 (Wood's Town Plan), to Mr Robert Rankin, and was gifted in 1855 to the Free Church (who had built their church at Hamilhill - it was renamed the Mure Church after receiving support from the Misses Mure, two local well-off sisters) at the time of their first minister, Rev. William Cousin (officiated 1850-1859). We know that the burgh had some responsibility for the upkeep of a school in 1560. In 1572, a burgh school at Kirkgatehead was endowed; it continued there until 1816. Throughout the 18th century the council consistently sought to provide good schooling - they paid the schoolmaster the maximum salary plus other fees and income, they employed extra members of staff, they improved the old building in 1724, after 1750 they completely rebuilt it, giving it two large rooms either side of a vestibule with a bell turret, and they added an extension in 1783. John Galt attended this school in 1787 for two years, and Edgar Allan Poe in the school's last year (1815-16). After 1816, the building was occupied by two free schools, by weavers, and from 1860 by the fire brigade; the line of its gable end can be seen in the adjoining building. The burgh school was replaced by an academy. The old building was demolished, by then boarded up, in the 1960s prior to the extension of the church hall (1968). In 1813, the Town Council granted land at the north side of the town for a new Academy. Thirty-one unemployed men were given work levelling the Gallows knoll. The foundation stone was laid on 22nd April 1814, for the building designed by David Hamilton of Glasgow, opened in July 1816, when it was decreed that there should be a "Holiday to the Pupils in all time coming" each 10th December, the birthday of Hugh, 12th Earl of Eglinton. In 1818 a royal charter was obtained by the earl in his own right and as provost. In 1900 this school was demolished and pupils were accommodated in halls until the completion of a new building, costing £16,000, designed by local architect John Armour. Now named Sovereign House, facing onto the Northern Approach Road, it was officially opened in December 1901 by the Earl of Eglinton, great-grandson of the earl who had opened the first Academy. It was proudly designated Irvine Royal Academy, a title only occasionally used before, by those who remembered the royal grant to the burgh school in 1572 and the royal charter of 1818. On the path between the church hall and the churchyard is the bricked-up Mortuary. It was set up in 1908, as one of several innovations organised by the Town Council of that time. During the First World War, in about 1917, it was converted into a bath house for the Royal Engineers billeted in the Church Hall. Later used as a store by the Church, it is now bricked up. Though the present building dates from 1773, a church was founded in the early part of the 9th century by St Inan, who lived and laboured around Irvine and Beith. Its influence soon extended to the source of the River Irvine, and there are records of gifts given by prominent families in the valley to endow missionaries or Chaplaincies. One of them to "Officiate at the Chapel of the Virgin Mary upon the bank of the water at Irvine." These messengers "carried the gospel to villages within a radius of forty miles and even to the 'Island of Aran'." The first Church belonged to the Celtic Church and the second, built early in the 12th Century, came under the famous Bull of Clement III declaring "The Scottish Church is the peculiar daughter of the Roman Church to which alone ('nullo mediante') she should show subjection". Early mention of St. Mary's Church occurs in the agreement between the Burgesses of Irvine and Brice the Earl of Eglintoun in 1205. It was built "small and rude of freestone ashlar" and was cruciform in shape, lit by narrow lancet windows turned with two arches. The oak panelling exhibited in Irvine Burns Club is a relic of this early Church. The carving is a fine example in the style of the Flemish Guild and the inscription, in Greek, reads: "Blessed are they who hear the word of God and keep it". The Church was not large, and by the beginning of the 18th Century, reference was made to the building as being too small for the growing population of the Parish. The Reformation being now past, responsibility for a new building lay with the Heritors of the Parish in consultation with the Presbytery of Irvine. Heritors meetings were dominated by the two leading Heritors - the Earl of Eglintoun and the Provost of Irvine. In their wisdom they decided that their successors should be relieved of any such responsibility in years to come and a large Church was decided upon to meet every future contingency. Hence the name given 'The Big Kirk'. The decision to build was made in 1770, with a seating capacity of 1770. Linked? Could that be a seat for every year of Christian Witness in the world? There has been a long and close connection between Town and Gown, with the Council, the Incorporated Trades, and Carters' Society. The Minister was Chaplain of all three, and each still has its own seating accommodation. Since the Reformation and until the end of the 18th Century, the Provost was given his say in the appointment of the Minister, session clerk and treasurer. There is however no record of the Kirk Session having anything to do with the appointment of the Provost. The Church had the dominant part to play in the education of the child with the encouragement and financial support of the Town Council. Early records speak of the school in the upper part of the Kirkgate, and later the guiding hand of the Church in the building of the Royal Academy in 1806 and of the new Royal Academy in 1902. The windows of the church are described on another page. Walking route: Go into the kirkyard. There are many interesting and historic stones, though unfortunately no full catalogue of them. y) A new headstone was laid in December 2008 to mark the grave of famous newspaperman John Mennons, the founder and first editor of "The Glasgow Herald", launched as the Glasgow Advertiser. On selling the Advertiser, he set himself up as a coal-master; when that venture failed, he moved to Irvine in 1814 in his late sixties, and, with his six children, published the "Irvine and County of Ayr Miscellany" in 1814-15 and "The Irvine Mercury" in 1815. He died in 1818. The grave location was discovered by Irvine historian Billy Kerr. The stone was paid for by the Glasgow Herald. Walking route: Leaving by the back gate of the kirkyard, there is an optional detour down the path on the right to the river. If you wish to miss #23, go straight on to an open grassy area, known as the Golffields, for #24. St Inan's One of many wells in the burgh, this one was named after St Inan, who came to Irvine in 839. For wells, see more information at no. 25 (Tanzie Well). The Powder House was probably first constructed about 1642 - King James VI (d.1625) had instructed all Royal Burghs to provide 'Pouther Magazines'. Records show that orders for large quantities of gunpowder were met in 1643, 1644 and 1646. 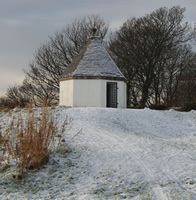 Saltpetre was locally manufactured from deposits in byres, stables and doocots, then stored in the safety of the Powder House, for use by the military in the Royal Burgh of Irvine. In 1781, following an unexecuted Franco-Spanish venture to invade the British mainland in 1779 during the American Revolutionary War, plans were made to rebuild it, and this was done by 1801, prior to the Napoleonic Wars (1803-15). In 1880, the town council formally discontinued use of the Powder House. Restoration was carried out in 1924, using slates saved by Provost R M Hogg from the demolition of the old wash-house on the Golffields - a rescue assisted by Rev. Henry Ranken of the Old Parish Church. It was again repaired in 1961, and in 1992 it was again restored, this time by Irvine Common Good Fund with assistance from Enterprise Ayrshire. On the adjoining slopes, the Powderhouse Brae, the Methodist missionary George Whitefield preached to an assembly of 5000 in 1742, at the start of the period of church secessions in Scotland. His preaching stimulated an evangelical enthusiasm which ultimately led to the formation of the Relief Church ten years later, in 1752. It initially met at the Golffields and in 1773 opened its own church on West Road. In the 16th and 17th centuries, pigeon dung provided a major source of saltpetre for the making of gunpowder. Until a better source of saltpetre was found, it was strictly forbidden to put hard floors in dovecotes. The saltpetre (potassium nitrate) was made by mixing the pigeon dung with earth, lime and ashes – don’t do this at home (says the Herefordshire Sites and Monuments Record). The saltpetre was then mixed with charcoal and sulphur to produce gunpowder. Walking route: There is an optional extra few yards of walking to the spring issuing at this side of the green footbridge, the site of the well, #25. If you wish to miss this, retrace your steps to the back of the churchyard, then make your way up the street ('Kirk Vennel') towards the main road, for #26. The name is thought to be a corruption of St Anne's Well or St Inan's Well. The area was always a place for washing clothes, and in 1749 (Strawhorn, p.95) the Council erected a washing house 35' x 15' for washing and bleaching. Other wells included one at Seagatehead (sunk in 1695) and one at Bridgegate (sunk in 1722, using stones from the medieval church steeple, dismantled in 1721 as being in dangerous condition), these two and an older one at the Cross being converted into pump wells by the Council in 1740. There were also wells at the Townhead (the Port well, named from the town gate there, the Whiskey Well and the Tollbar Well), one at Kirkgatehead, one at the Puddleford (the Black Well), others in Glasgow Vennel and Cotton Row, further up the High Street (the Grip Well and the Townend Well), further out at the Gallowsell, at Seagatefoot (the Slaughterhouse Well), and the Chapel Well. Walking route: Return to the back gate of the churchyard and make your way up the street (Kirk Vennel) to the main road. There used to be a water pump on the verge here. A cast iron fluted column, dating from about 1878, and manufactured by Glenfield & Kennedy Ltd, Kilmarnock, it is the last surviving trace of Irvine's first piped water supply. It has been renovated and is destined for the museum due to open in 2015. The two old gates ('ports') at the north and (here, at Townhead) south ends of the High Street were demolished in 1756 to improve the road through the town. Not only did they narrow the road, but their condition was "ruinous". Here, a house which encroached onto the street was also demolished. nevertheless, the location, marked by the Porthead Tavern (a new building on its old site; the old building was the home of Provost Hamilton, who befriended Burns in 1781), is still a traditional halt in the annual Marymass parade. In 1901 and in 1910, the proclamations of loyalty to the new monarchs were read at the market cross, at the two ports, and at the harbour. 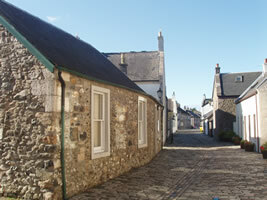 The barber's shop is on the site of the original manse for the Parish Church, and the street name (Kirk Vennel) records the original narrow road to the minister's glebe. A separate alley afforded the minister his own access to the churchyard and his church. Walking route: Cross over to the cobbled street opposite - Glasgow Vennel. Known in 1426 as Smithy Bar, its renaming by the end of the 1600s indicated its importance as the main road to Glasgow (Bank Street was not constructed till 1828). Robert Burns came here as a young farmer eager to learn the trade of flax dressing, working in the Heckling Shop, and lodging a few doors away. By the 1970s, the buildings were mostly unoccupied, and facing almost certain demolition. The Heckling Shed, also known as the Heckling Shop or House, was at the rear of no. 10. Irvine Development Corporation’s Chief Architect Ian Downs persuaded the authorities that restoration of this historic street was feasible. In July 1980 the Corporation initiated discussions with Cunninghame District Council with a view to setting up a joint project for restoration of the Vennel. Other bodies such as Irvine Burns Club, the Scottish Tourist Board, the National Trust for Scotland and the Clement Wilson Foundation (see the page on Clement Wilson) also declared their interest. This led to a Steering Committee, chaired by Lord Ross of Marnock, a noted Burnsian. Restoration work began in 1981. Early success prompted further phases. 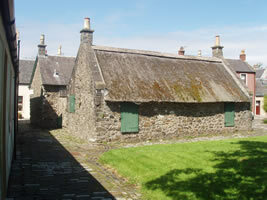 The third phase, funded jointly by the Scottish Tourist Board and the Clement Wilson Foundation, included restoration of the Heckling Shed and no. 10, with its unique curved frontage. A fourth phase renovated the flat where Burns had resided. The Vennel gained a Europa Nostra Award for conservation in 1984 – a street of history bringing pleasure and pride to the modern town. Mrs Elspeth Buchan was invited to Irvine by a local minister, Rev Hugh White, in 1783, and soon had enough followers to hold meetings - first in a tent in White's Seagate garden, then in the Glasgow Vennel house of Patrick Hunter, a prosperous lawyer and merchant. She and her followers were twice driven out of Irvine by mobs, and twice returned, to be formally banished by the Town Council in 1784. The Buchanites were “waiting for the second coming of the Lord” and believed “that they, alive, shall be changed and translated into the clouds, to meet the Lord in the air, and to be ever with the Lord”. For more details, see Strawhorn, pp.88-89 and Chalmer's 1812 Biographical Dictionary. Elspeth Buchan convinced White that she was "the woman clothed with the sun" referred to in the Book of Revelation 12:1 ("And a great sign appeared in heaven: A woman clothed with the sun, and the moon under her feet, and on her head a crown of twelve stars."). White assumed for himself the role of "man child" referred to a little later in the same text. Burns lodged here in 1781. 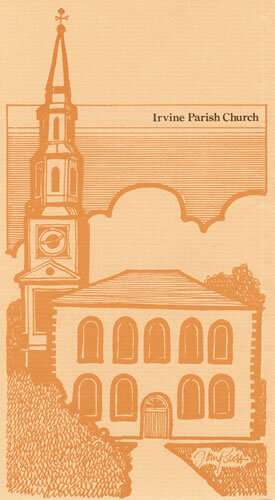 For his time in Irvine, see the page in the Irvine Burns Club section. Where Robert Burns worked - for this also, see the page in the Irvine Burns Club section. After the buildings were renovated in the early 1980s, the front cottage became, for some years from 1983, the home of the Ayrshire Writers and Artists Society. The 1981 World Burns Conference delegates in 1981 were shown the plans, also in model form, for the renovation. Walking route: Return to the main street, turning right at the Porthead Tavern (a new structure on the site of the hostelry owned by Provost Charles Hamilton, whose son John was good friend of Robert Burns). This housing area opposite the Town House is on the site of a bygone house in its own grounds, the birthplace in 1772 of David Boyle, see no. 12 (The Black Man), and known as Boyle's Parterre. In the 1820s its occupant, Councillor John Fletcher, a surgeon, was one of two main suspects (Strawhorn, p.113) in the body-snatching which supplied corpses to Glasgow University. In 1839, for the Eglinton Tournament, Prince Louis Napoleon (later Emperor Napoleon III of France) lodged in the Parterre. The house was destroyed by fire (c. late 1960s), and the new housing was constructed in the 1970s. In medieval times, a mercat (= 'market') cross stood in a location now marked by cobbles in the road - nothing of the cross survives. The War Memorial, in the style of a typical Scottish mercat cross, suggests whay it may have looked like. Unveiled in 1921 in the middle of the street, it was moved in 1951 and re-sited to its present position in 1952. Walking route: You are now back at the Town House where you started. It has served as Council Chamber, Court House and Library, and will be renewed as a heritage centre for the town. In the area behind once stood the police station - built in 1860, when it replaced the Tolbooth in the centre of the street, it was demolished in 2013. We hope you have enjoyed the many and varied aspects of this burgh's heritage. 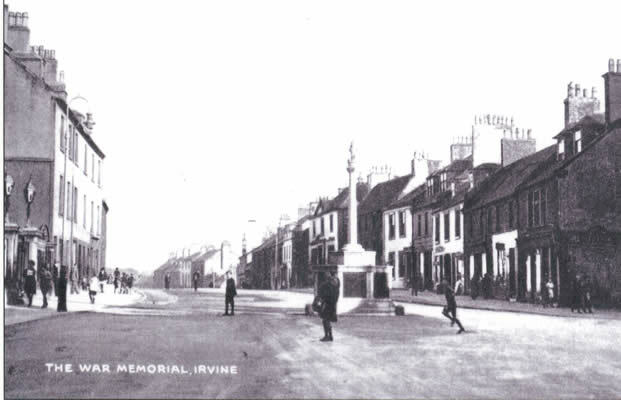 Robert Burns lived in Irvine in 1781-82, "learning something of town life" and coming to the realisation that his poetry was of sufficient merit to be published. The statue, sculpted by Pittendreigh McGillivray, was donated by James Spiers and erected in 1896 on the centenary of his death. Further information is at www.irvineburnsclub.org - see the page about the statue. A hill on the outskirts of the town (on the original road to Bartonholm and across the river to Saltcoats) served as a site for gallows, and for the burning of witches at the stake in 1650 (12 in March, and 5 in June). In 1813, 31 unemployed men were given work levelling the Gallows Knowe prior to the construction of the new Academy. The Gallowsknoll (at £15 per annum) and the Low Green were still being leased for pasture by the Burgh agricultural committee in 1908. John Allan (b.1779 in Irvine, a successful Scottish merchant in Richmond, Virginia, who dealt in a variety of goods including tobacco, cloth, wheat, tombstones, and slaves) adopted (never formally) Edgar Allan Poe (b.1809 in Boston, Massachusetts) - Edgar was orphaned young when his mother died shortly after his father abandoned the family. When the family came to Britain in 1815, the boy stayed with his aunt Mary Galt at Bridgegate House and began his schooling in the last year of the old school at Kirkgatehead. Though the six-year-old enjoyed trips to Arran and Kilmarnock, he found the regime of kirk, school and Bridgegate oppressive to his peculiar nature, so was sent to rejoin the Allans in London in 1816, before returning to Virginia in 1820. The Masonic Hall, built in 1904, succeeded the hall in Kirkgate where Lodge St Andrews had met since 1862. The Orange Hall was opened in 1872 with a great procession which involved "violent Party feeling . . but no occasion for the interference of the Police". Being the first in Scotland, most of the 5,000 participants were from visiting Orange lodges. There was also praise for the "turn-out of the working-class in such excellent holiday attire". This hall was built by the Good Templars in 1871 – part of a temperance movement of the 1870s. "The child represents the future, symbolising the store and the town growing through time. He is poised as though playing, with a small paper boat in one hand and a paper bird in the other. I liked the idea of these objects being hand-made and styled them as though the child had made them himself. "The boat refers to Irvine's maritime history and the river, while the bird references the coastal wildlife of the area and all our concerns for the environment. Both of these themes were suggestions proposed by the schoolchildren at the initial consultation. But the boat is also intended as my own small tribute to the great Scottish artist George Wylie, who sadly passed away during the time of this artwork's creation. "As with all my sculptures, I hope the people of Irvine and the staff and visitors to the store create their own narrative and stories around the imagery of the sculpture. I hope he becomes a proud part of the town's environment." The Harbourside now has a website of its own, so visit www.irvineharbourside.org when you have time. The "City of Adelaide" deserves a mention in these records, as it reposed at Irvine for two decades - from 1992 to 2012. Built in 1864 in Sunderland, it is one of only three composite vessels left in the world - made of wooden planking on an iron frame - the Cutty Sark in London being one of the other two. The "City of Adelaide" holds the record (65 days) for the 12,000 mile trip from Adelaide to London. It carried a range of cargoes, including wool and even Australian wine as early as the 1870s. In 1923 it was bought by the Admiralty, renamed HMS Carrick and later made into the Royal Navy Volunteer Reserve club - it spent 50 years berthed at Custom House Quay in Glasgow before sinking, mysteriously, in Princes Dock in 1990; when it was raised in 1991, there were no holes in it. It was acquired by the Clyde Ship Trust in 1990 for £1 andin 1992 taken to the Scottish Maritime Museum at Irvine. Although listed as one of Britain's most important vessels, by the National Historic Ships Committee, its location in Irvine, its deterioration in condition, and the cost of conservation work, caused it to remain on the slipway of the former Irvine Dockyard for two decades, a visible reminder of our inability to celebrate its history. It has since left for Australia. This pavement artwork was, until 2013, outside what is now The Carrick hostelry. It is currently lifted and in store, awaiting re-installation somewhere else in the vicinity. This description will be re-positioned in this narrative once its new location has been announced. The sculpture is by Ian Cooper and was installed in 1996, the 200th anniv. of the death of Robert Burns. Its main text reads: “O raging Fortune’s withering blast has laid my leaf full low!”, written by Burns in 1781-82, while in Irvine (full text below). The quote recalls the poet’s gloom, plus the treatments given to Burns on five doctor’s visits from 14th to 22nd Nov. 1781 (in the following, the upper case are the words inscribed in the pavement, and bold indicates what was discovered in the daybook of the doctor who saw him, Dr Fleming) (i) IPECACUANHA, the powdered root of a South American tree, used as an emetic, (ii) a sacred elixir of rhubarb and aloes, a powerful laxative, RHEUM PALMATUM and ALOE VERA, (iii) an anodyne, a painkiller, probably PAPAVER SOMNIFERUM, the opium poppy, and (iii) CINCHONA, the powdered bark of a South American tree containing quinine in its raw form, prescribed to reduce Burns’ high fever. Has laid my leaf full low! And made my branches grow. Laid a' my blossoms low.